Live Creating Yourself. : Well hello 2010, I'd like you to meet my new bathroom. Well hello 2010, I'd like you to meet my new bathroom. While bloggers around the world are probably posting today about sparkly dresses (been there) and high heels (done that), I present to you my new bathroom. Now I know this might not seem like much to those people with big houses whose bathrooms have two sinks and jacuzzis for two and blah blah blah blah... but to a gal who shared a bathroom her entire life with siblings, parents, 6 female college roommates, and one nasty grimy bathroom with a boyfriend, this. is. luxury. It's not huge. But it's pretty. Recently refinished with vintage-esque fixtures and tiling, my apartment's bathroom sports a spanking new toilet and sink (rare in Chicago apartments), pretty soft green walls that conveniently match the towels I bought prior to seeing this color, and get this - a jetted tub! Thus far, it is the only room that is ready to greet guests tonight for my NYE pre-bar cocktail soiree, but the main rooms are not far behind. It's been a HECTIC and exhausting three days, my back is aching, and I have hours of Swiffering ahead of me. Alas. I will persevere. And tomorrow (granted it will be later than the normal 7am CST posting), you will find pictures of the hopefully finished apartment! "Everybody who's excited say 'Yea!!'" 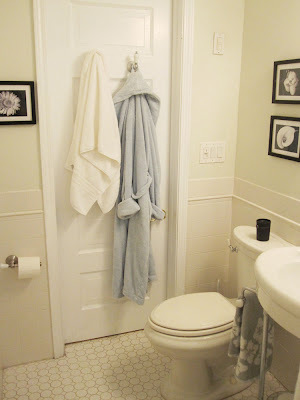 The clover towels are from West Elm in the color blue sage. They're currently on sale! And I found the white fluffy ones at Costco for $7 a piece - not too shabby for Alaina. 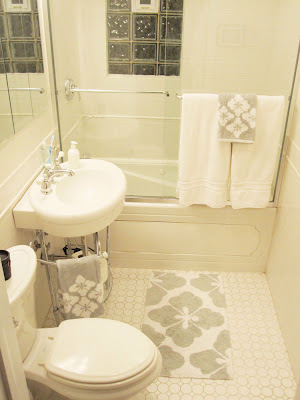 I love the vintage tiling and fixtures. Holiday scented Archipelago candle. Heavenly. p.s. Bathroom Cabinets at Illuminated Mirrors are a great way to add extra light to your bathroom. The bathroom looks incredible. Actually the whole place does. Well done my lass, well done indeed! Love, love, love the bathroom. Waiting with anticipation for the rest of the apartment. Well done Alaina, just as expected! You will never tire of that classic bathroom--it looks wonderful. Enjoy this evening! 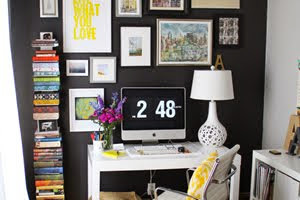 Wow, just found your blog and your bathroom is beautiful! I think I would just spend New Year's Eve in there, if I were you :) The towels and bathmat are great finds. It looks great! I can relate to what you said about not having a huge bathroom with two sinks. We only have one small bathroom in our house. I really like how yours looks so serene and inviting. And I'm super jealous of the jet tub! I am bugging my husband to get one. Gooorgeous bathroom! I love the vintage fittings - we need to re-do our bathroom this year so I'm keeping your pics for inspiration! i'm loving it! 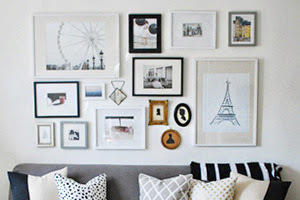 i'm so pleased to have come across your wonderful blog and have added you to my links over at urban flea! happy new year, and i can't wait to see what you come up with! I love those towels ~ are you as excited as I am that West Elm is opening in the city!? 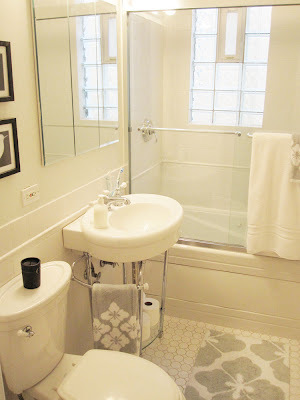 I love a white bathroom it clean and fresh and you can change colours with towels and accessories. Vintage tiles are great as well. Beautiful.